The announcement, which will become effective October 1, comes just over a year after Apple cut the program’s revenue sharing rates for mobile apps from 7 percent to 2.5 percent. Affiliates will still continue to earn a commission on linked sales for iTunes movies, TV shows, music, and books, as well as subscriptions to Apple Music. 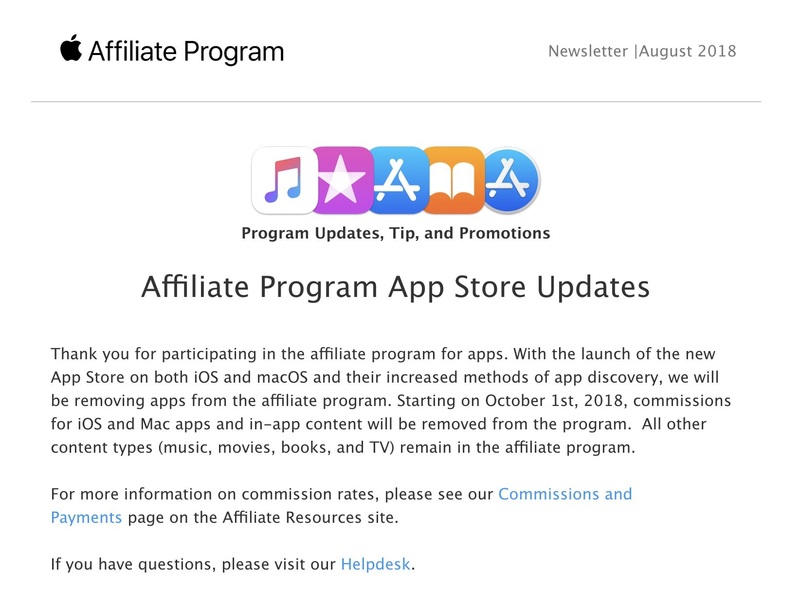 In a note sent to affiliate program members, Apple said the long-running program is shutting down because of “the launch of the new App Store on both iOS and macOS and their increased methods of app discovery.” The implication, it seems, is that Apple’s own built-in app discovery algorithms are now so good that it no longer needs to encourage actual humans to recommend and link to specific apps and games via the Web. In 2016, Apple introduced its own “Search Ads” program that lets developers pay for prominent placement on App Store search results. That move has led to some adverse consequences for app discovery, though, as direct searches for popular games and apps on iOS now often return ads for completely different apps as the top result. Apple brought in an estimated $ 16.3 billion in mobile gaming revenue in the first half of 2018, according to a recent Sensor Tower report, up from $ 14.2 billion a year ago. It’s hard to say how much of that revenue was driven by affiliate links, but Apple’s decision to shut the program down suggests it doesn’t feel it’s a major revenue driver. Apple’s decision comes as a sucker punch to outlets like mobile gaming news and reviews site TouchArcade, which has long relied on the App Store affiliate program for a significant chunk of its revenue. As TouchArcade editor Eli Hodapp writes in a despairing post, the loss of the “reliable” affiliate revenue stream could very well kill the site, which will now lean more heavily on Patreon donations and Amazon affiliate links to stay afloat.